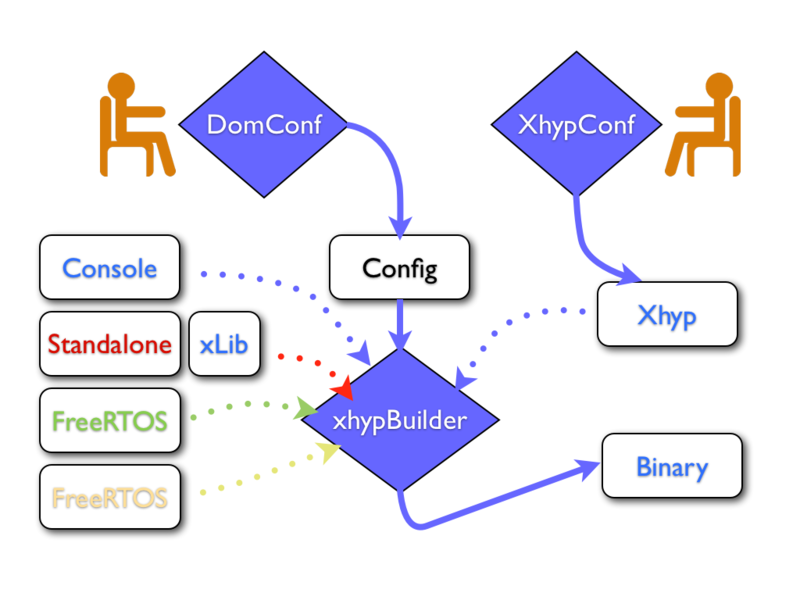 X-HYP is a type 1 hypervisor with realtime performance and para-virtualized guests. Unlike X-Hyp-Free which is licensed with a GPL-v2 license, Xhyp Pro is licensed with a commercial license. Xhyp Pro includes a lot of improvements against the free version. More schedulers: EDF and CBS schedulers. Precises timers, with up to nano seconds precision depending on architecture. Precision do not mean you can trigger a timer every nanoseconds, this, depends on hardware, configuration, scheduler etc. , but nanoseconds is the precision you can use to schedule a domain or triger a timer inside of a scheduled domain. X-HYP guarantee this precision as long as the hardware timer is precise enough, getting rid of software, bus and caching overhead. ARMv4 : ARM926ejs processor with MMU, a general purpose processor largelly used in embedded systems. ARMv7: Cortex A8 processor with MMU, the new generation of ARM processor with enhanced security (trustzone). POSIX: confirming to POSIX 1003.1b with 32 levels of priority and FIFO and Round Robin classes. Allowing multiple POSIX realtime partitions and multiple GPOS partitions. This scheduler is targetting control-command applications. ARINC: partially conforming to ARINC 653 with dynamic plan modification including large and small frames. Allowing multiple ARINC realtime partitions and a ARINC partition manager. This scheduler is targetting aero-space applications. Sproradic: to respond quickly on a single dedicated realtime partition. Allowing a single realtime partition and multiple GPOS partitions. This scheduler is targetting phones applications. EDF: Earliest Deadline First scheduler. With per partition budget and deadline and a dedicated domain for EDF scheduling issues. This scheduler is targetting robotics applications. CBS: EDF based Constant Bandwidth Scheduler to insure a domain gets scheduled for a defined time slot on a defined period. This scheduler is targetting multi-media applications. Define ARINC, EDF or CBS control domains.